The Cam-Hammer Analog Synthesizer was a project for the 2014 Inventgenuity Festival at the Beam Center designed by Eun Jung Park and Mark Kleback and assembled over a 2-day weekened by over 800 festival attendees. The Inventgenuity Festival is a 2-day event centered around workshops for kids ages 6-13. It takes place in the Invisible Dog Art Center, and some of the workshops include making music with colors, games using Google's text-to-speech algorithm, and mechanically bending wire into interesting shapes. 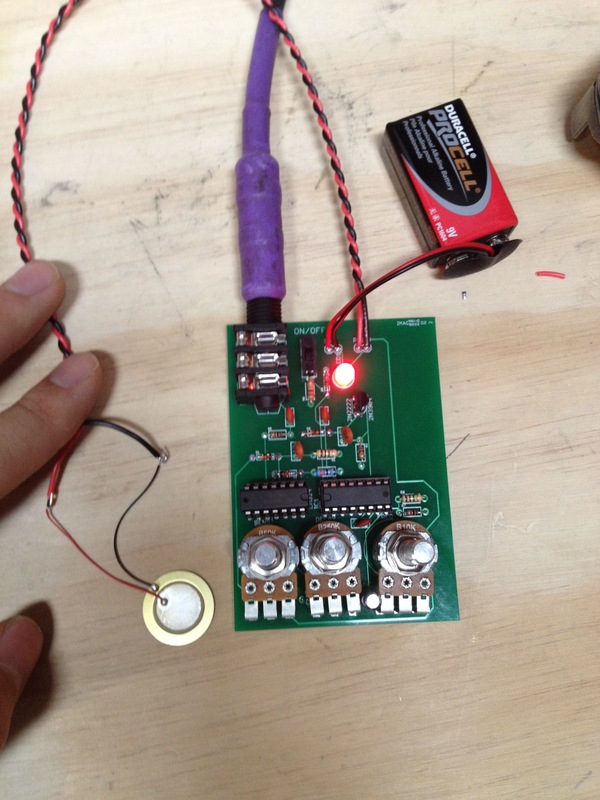 Since I had been teaching a class about building electronic drum triggers, Beam asked me to design the circuit that the hammers would strike. 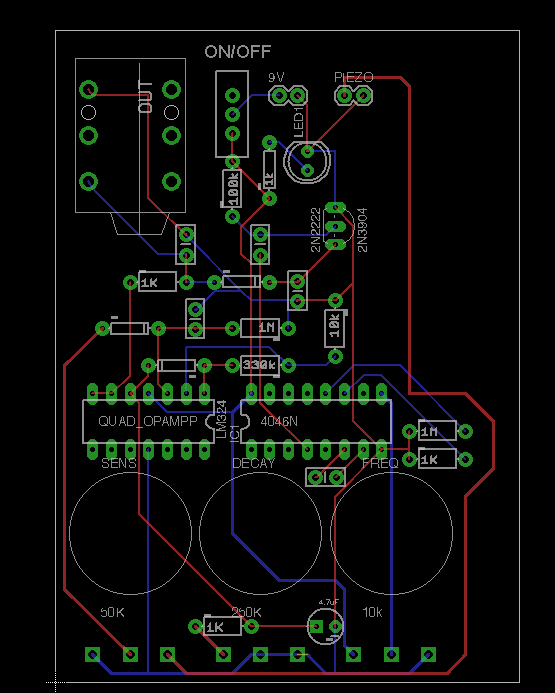 After some brainstorming, we settled on an analog drum trigger that could tune to different frequencies. 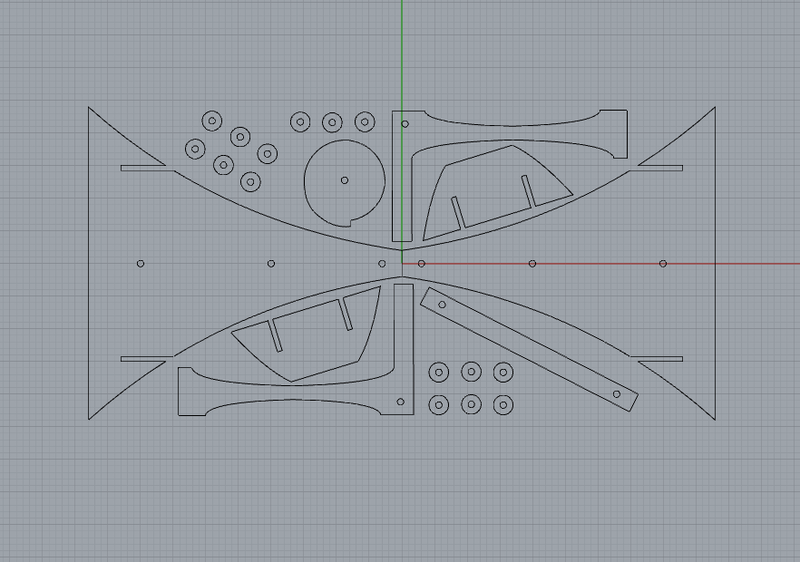 This would allow us to construct a giant cam-hammer powered analog synthesizer. We enlisted the help of master fabricator Matthew Epler to design the four-foot version of the cam-hammer. 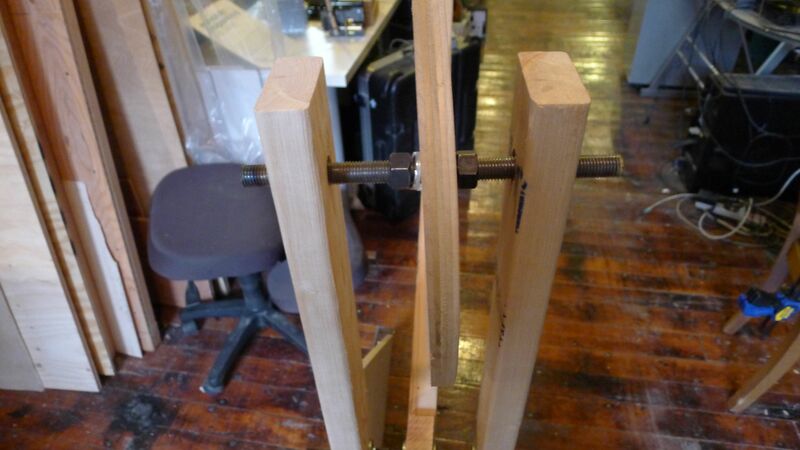 The initial version of the hammer used 2x4's, threaded metal rods, and sheets of plywood. 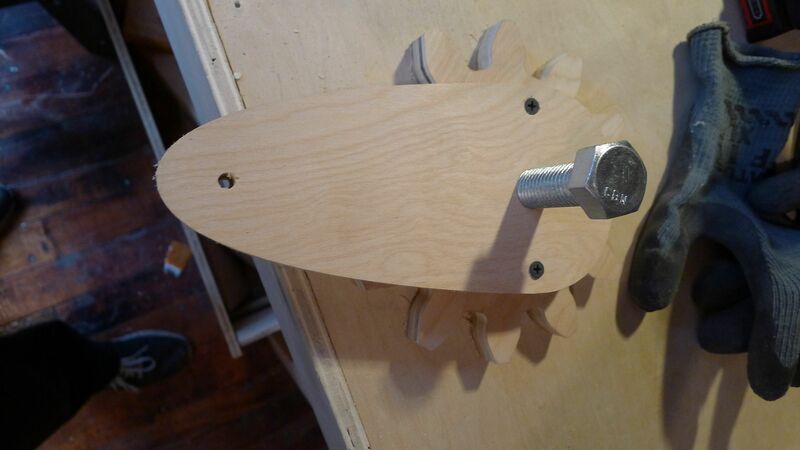 However, the torque of the crank was too much for the wood, the nuts on the metal rods didn't hold the cam in place, and the model was eventually destroyed. 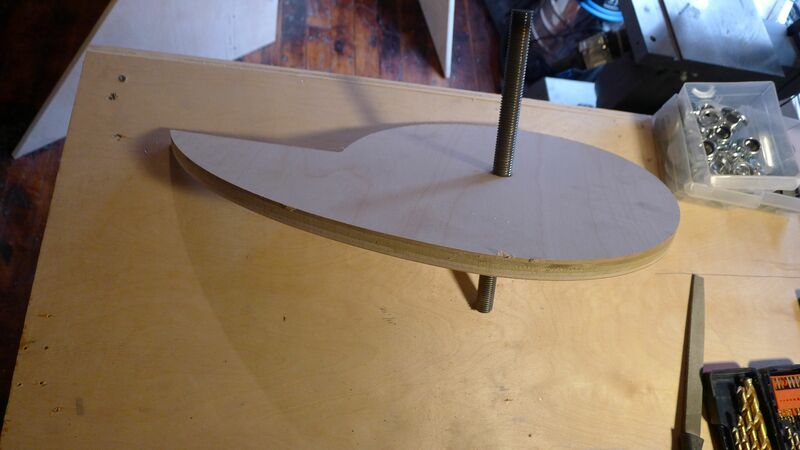 The second model was cut out of plywood on a CNC machine. The metal rods were switched to wooden dowels, and instead of nuts, wooden washers were cut out of plywood to keep the cam in place. 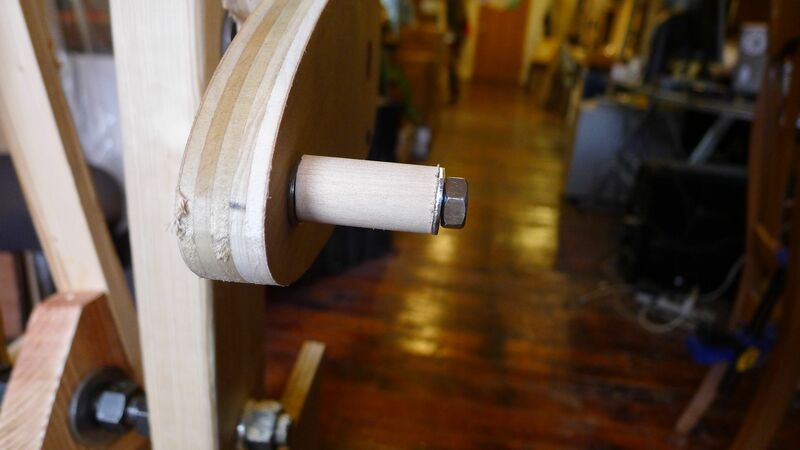 Since this version was made entirely out of wood, it was much more resilient to consistent torque. 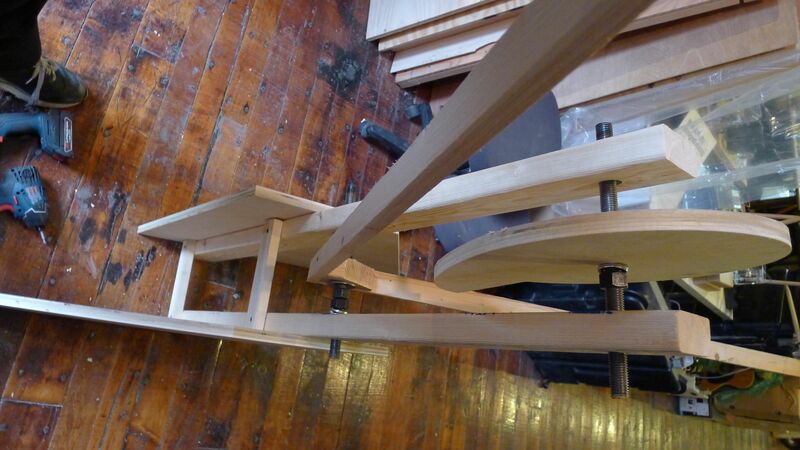 For the festival, we needed to be able to fabricate 15-20 cam hammers, so the CNC option was not viable. 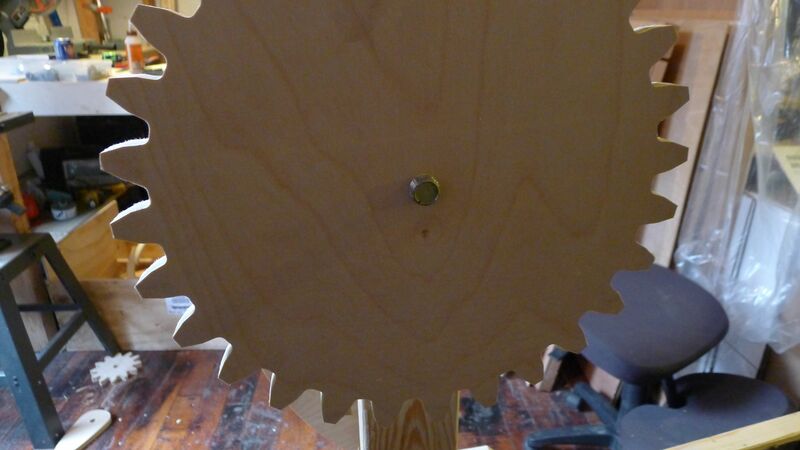 We decided to use a jigsaw and a drill press (for the wooden washers), and have everything cut on site out of plywood. A group of Beam workers assisted the festival attendees as they cut, drilled, and screwed together 15 1/2 cam-hammers over the course of two days. 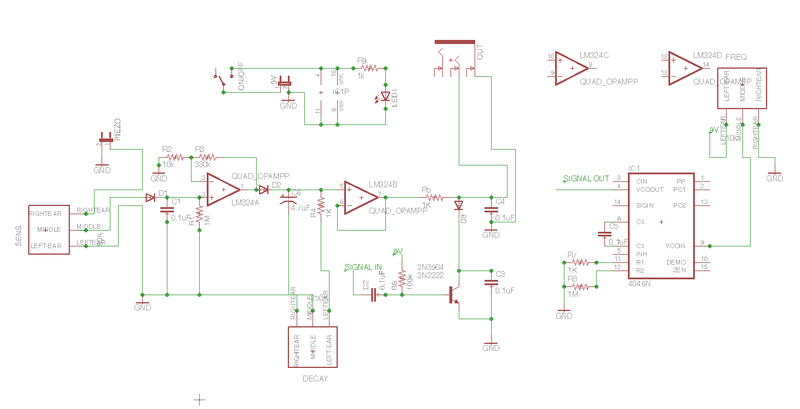 Designing an analog drum trigger was a bit more complicated than I imagined. I outlined part of my process in my Drum Synth Research blog a few months back. Essentially, there were three parts to this circuit: one part that handled the voltage spike from the Piezo transducer, one part that generated an audio frequency, and one part that combined these together so that the audio is only heard when the piezo is struck. The audio output for each board was run into a mixer and played through a PA system in the room. Initially, the force of the hammer was too much for the delicate piezo transducer, so we used hot glue and foam to protect it when placed under the hammer.